Nearly one year after the murder of Michael Brown, Ferguson activists have narrowed their sights in on the city’s wealthy fathers. On virtually every Fourth of July since the late 19th century, the people of St. Louis have paraded through their city’s streets, floats and all, in what’s referred to as “America’s biggest birthday party.” It’s the Midwest’s own — if slightly more tame and patriotic — version of Mardi Gras. Known as Fair St. Louis, the festivities, prior to 1992, had a much more ominous name — the Veiled Prophet Fair. Each year, the “VP Fair” is hosted by the Veiled Prophet Organization, a secret society comprised of St. Louis elites. The public face of the Veiled Prophet Organization, complete with its own KKK-style regalia, was first imagined as a means of social control following the Great Railroad Strike of 1877 — one that, not coincidentally, featured an uncommon degree of solidarity between white and black workers. The strike itself lasted for 45 days before being broken up by police, but not before it grew to include demands around better working conditions and wages for porters, as well as a more general call for reforms like the eight-hour workday and an end to child labor. “More than just a series of gaudy floats traversing the city streets,” as Scott Beauchamp wrote last year for The Atlantic, “the parade and all its pomp was meant to reinforce the values of the elite on the working class of the city.” The VP Fair outlived the strike, as did the bizarrely ritualistic VP Ball, which is held every winter and sees wealthy city fathers choose some municipal magnate to act as the “Veiled Prophet” himself and preside over the elaborate and highly exclusive ceremony. According to Beauchamp, the message of the Veiled Prophet Organization was clear: “We, the bankers and businessmen, have a monopoly on violence and wealth. We are grand and mysterious, and also to be feared.” It is no coincidence, then, that the first prophet unveiled in the inaugural 1887 ball was the St. Louis police commissioner who had played a key role in suppressing the strike: quieting civil unrest is in the lifeblood of the fair and the city elites behind it. For good reason, then, the St. Louis area has become a flashpoint for racial injustice and police brutality since unarmed teenager Michael Brown was shot down by police last August in nearby Ferguson, an event that launched what’s now known as the movement for black lives. Nearly one year later, activists there have narrowed their sights in on the city’s wealthy fathers — the esteemed denizens behind the Veiled Prophet that continue to play a key role in St. Louis’s political machine. Launched last week, the website Power Behind the Police is a repository for information on the “St. Louis 1 percent” compiled over the last several years by Missourians Organized for Reform and Empowerment. According to organizer Julia Ho, “Our view is that the police are one part of a much more pervasive and systemic problem, and that problem really results from economic and racial injustice.” As they see it, police violence has a direct line of connection to the 1 percent. MORE, as it’s known, is a membership-based organization of low and moderate-income city residents that works jointly on issues of racial, economic and environmental justice. Alongside other long-standing local groups like the Organization for Black Struggle, MORE was one of the first responders on the ground when protests erupted in Ferguson last summer, providing jail support and bail fundraising. Its research efforts and the organizing that compliments it are an effort to make the connection between police brutality and corporate power in St. Louis more widely known — and build up a movement to confront it. There was no time better to launch the site, as MORE saw it, than in the lead-up to the fair. Preceding July 4, they held a week of actions entitled “Unveil the Profit,” targeting the tight, shady network of kingmakers highlighted at Power Behind the Police, many of whom profit directly or indirectly from prisons, privatization and well-funded patronage networks. 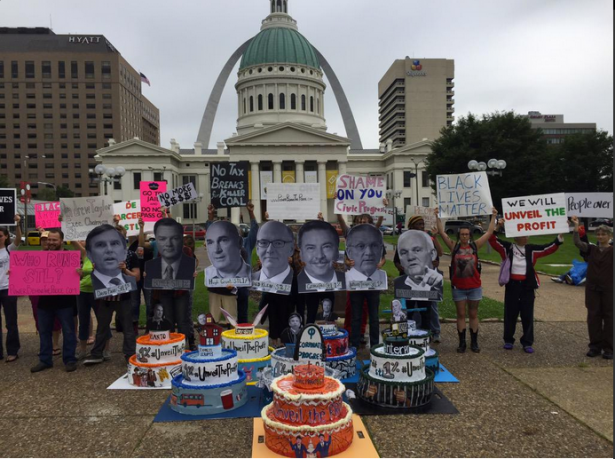 Each day of the week, they traveled — art installations in hand — to the homes and offices of seven of St. Louis’s wealthiest CEOs, making their target on a given day a surprise to all but the events’ core organizers. According to Ho, Power Behind the Police “really reaffirms what a lot of folks who’ve grown up here know, which is that there’s really a very, very small 1 percent, a very small group of elite, mostly old white men who are calling the shots here.” Unveil the Profit is attempting to throw a wrench in their system. On Saturday, to continue the momentum, the group will host “Change the Course,” a forum for MORE members and St. Louis residents to imagine #WhatSTLFreedomLooksLike together as they continue going after the city’s most influential executives. As MORE is now seeing in St. Louis, the Black Lives Matter movement has opened up new space for organizing across sectors. Over the next several months, activists there will continue to unveil — and target — profiteers, as well as build out, with its members and other St. Louis-area residents, a vision for freedom in the face of police violence, mass incarceration and severe economic inequality. Given that the St. Louis area is hardly alone in its vast concentration of wealth and power at the top, the work happening there could provide an exciting model for activists in other cities to take on their own veiled prophets.